There’s one tree species I’ve been holding out on for a while. Sure, it doesn’t take over an area quite like the last two examples, but it’s still pretty impressive if you ask me. Today we’re going to talk about Hura Crepitans, also known as the Sandbox Tree. Native to the tropical regions of North and South America, including the Amazon rainforest, this evergreen tree prefers wet soil, and partial shade or partial sun to full sun. It is often cultivated for shade, and can grow up to a towering 60 metres (200 ft) tall! The flowers have no petals, because this is what happens when Dryads join the Unseelie court. Yes, it’s a tree covered in thorns. That’s just for starters. As we go on, I’d like you, dear reader, to picture something for me. It’s an exercise I like to do whenever I find out about a pretty crazy tree or plant. Picture a forest of these. The soft daylight filtering through the leaves in the tropical heat, the birds nesting in the branches (possibly the Shrike, considering all the thorns), the swaying limbs in the breeze, as nothing but these trees, each covered in thorns, can be seen for miles around, towering over the landscape. Now, as you walk through this forest of dappled light and spiky pillars, you find your way to a small pond where a few of the trees have been knocked into the water by an older dead one, split open as they fell. The pond has dead fish floating in it. That’s because these trees are also poisonous. Fisherman have used the milky, caustic sap from this tree to poison fish, and natives have used it to make poison arrows. No roasting marshmallows on a stick or letting it get on a wound suffered in combat. A punji pit made with fresh green branches supplies its own limited form of poison. Ewoks just got even more deadly. So you thread your way carefully, when you hear some popping or banging way in the distance. See, this tree doesn’t spread its seeds through wind or fruit, or even spores. No, that’d be too simple for this tree. This tree spreads its seeds through ballistics. See that seed pod? When the time is ripe, they explode, launching sharp wooden hooks at 70 metres per second (160 mph). Not something you want to be caught in the middle of. Now imagine if some group were crazy or cruel enough to take this tree and use it for tree shaping. Or if someone cast Awaken on it. 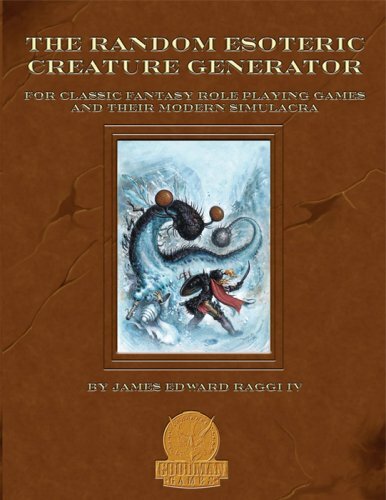 One of my all time favorite resources, which I’ve never had the chance to put into full use, is the Random Esoteric Creature Generator. This thin book can replace almost an entire bookshelf of Beastiaries, and is system agnostic to boot. Pathfinder, D&D 5E, whatever you play, you’ll get ideas and some basic stats to go off of. And what’s even better, they understand what makes fantasy feel fantastical. How many times have you or your players faced against a monster or group of goblins/orcs/etc that you’ve seen thousands of times before, and just felt a little bored with it all? Does the enemy being goblins/orcs/etc actually add anything to the experience that them being a different tribe or culture of humans wouldn’t? The monsters, a critical piece to any game that strives for the fantastic, have lost all sense of wonder. The common foes have bled into every other role-playing game, into video games, into ‘literature’. A [GM] can come up with interesting settings, and players will react appropriately. A [GM] can come up with all sorts of plots, mundane and sublime, and players will react appropriately. A [GM] can devise fiendishly clever traps and players will exercise due caution. But no matter how obliquely a monster is described, you can be sure the second that description ends, players will act with almost-robotic predictability in their approach to fighting the monster. When was the last time you or your players have ever fought something that you had no clue what the heck it was? Remember how exciting that fight felt? This book, with a series of tables, gives you the means to inject that wonder into your games once again. I’ll be leaving out the base stats that the tables adjust, and just going with what the tables give me to work with. First up, basic body shape! This creature walks upright on two limbs, and has two limbs it uses for basic manipulation. I rolled 2d10 again, and got 10 (1+9). So far my rolls are pretty middle-of-the-road, let’s see what that gives me. This creature is cold-blooded and covered in scales. It will have a maw full of sharp teeth, giving it a bite attack. The creature also gains a bite attack and a 1d8 AC bonus. Looks like we’re going with reptile people so far. Either something similar to the lizardfolk, or a good start on some reptilian conspiracy theories. But oh well. On with the experiment! Next up we have size, 2d10 once again! I roll a 12 (8+4), finally getting at least a little bit further away from the middle. Giant humanoid lizards. Okay, interesting. Kinda hoping I would have rolled the option labeled “Run! It’s Godzilla!”, but I digress. This is the standard movement method suggested by the creature’s basic shape and features. If it looks like a creature would therefore have no real movement method, then it is immobile. Okay. Attack methods. With a new die this time. 1d10. I swear I’m actually rolling real dice, here, readers. The creature merely mauls its prey with clubbing blows, doing standard damage. NOW, things are about to get INTERESTING. Because now we start getting to the fun features. Distinctive Features, to be exact. And now the tables start getting large. d% time! Changing dice again, just to be sure. 04! Yes! I knew my original dice wouldn’t fail me! The creature is continually covered in blood, which it secretes much in the same way people sweat. Every movement the creature makes, every attack it makes, and every blow it takes will spatter blood around the battlefield. 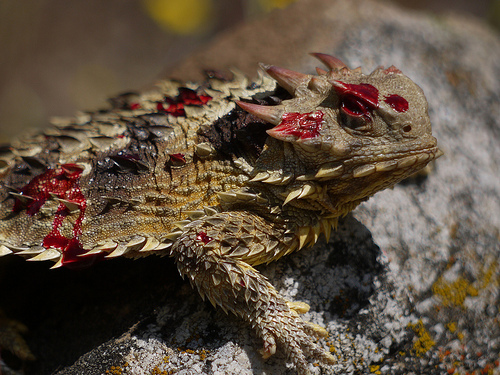 Kinda reminds me of the Horned Lizard’s defense of squirting blood out of its eyes at predators to scare them away, because they’re just that metal. We have so far put together a Large-sized, humanoid lizard that walks around, biting and bashing people as its form of attack, and on top of all that it’s constantly soaked in blood, drenching everything around it as it swings its limbs in long giant-sized arcs for each bash attack. The players are going to walk away from this looking like they got in a fight with a lawnmower. Just imagine what tracking this creature down will seem like, with attack scenes covered in enough blood to make any CSI veteran take a step back, before the players really discover where it all comes from. This is the good stuff, right here. And that table goes on for 4 pages total, filled with similarly awesome and weird entries. This creature takes half damage from Acid effects, or no damage if it makes its save. Not quite what I think of when I hear “immune”, but eh. I should also point out that I am using this Special Abilities section incorrectly. There’s a means to determine how many special abilities the creature gets, so it can have none if it’s pretty weak, or get multiple if it’s lucky or pretty tough. And there’s a few doozies, like “Duplicates Upon Being Hit”, or “Damage Does Not Heal”, amid a myriad of other options like “Shape Shifting, One Form” or just “Fairy Glow”. Now, we didn’t roll anything giving this creature a special attack, but there are plenty of options that do that, and another table to roll on to determine how said attacks are delivered! Let’s roll on that one just for fun. 2d10, result of 13 (4+9). The special attack is delivered when the creature hits with one of its normal attacks. So we have a blood-soaked giant lizard that bites and bashes in a fight. This leaves the question: how does it fight? The creature will always attack the foe that inflicted the most damage to it earlier in the round, or in the prior round depending on how the [GM] handles combat declarations. If ever there was a Berzerker monster, I’m pretty sure I’ve just rolled one. Just imagine seeing this thing go wild on the battlefield. And maybe go after any wizards that think fireball is a good idea. The creature is something of a psychic vampire, feeding off of the fear of its victims. If those it attacks show no fear whatsoever ([GM]’s should gauge the player’s reaction to the creature to determine this), the creature will attempt to disengage from combat and escape – there is nothing for it here. Well that explains all the blood. So we have a Large-sized lizard-person, constantly soaked in blood and immune/resistant to acid, that wanders around feeding off of fear and then leaving when noone fears it enough. One thing that this book stresses is that these creatures should be unique in your world, and probably not even given a proper name. Instead aiming for things like “The Beast of Backwater Barrows” or something. This enhances the experience, making it more memorable and thus more entertaining. The PCs hear a few rumors, or come across some horrific scene, perhaps a few dead but always some survivors, and begin following the bloody trail, catching clues and snippets of information before they finally track down and confront the creature like nothing they’ve ever seen in any Monster Manual. Once they steel themselves, it suddenly escapes, and they have to hunt it down again. Once again, I highly recommend you give The Random Esoteric Creature Generator a shot. The book concludes with a few pages discussing how to use the creatures you create to best effect, making your games feel fresh and new again! This was just one example, there’s all sorts of wild creatures to be rolled up and add some unique experience to your games instead of the usual seen-it-a-hundred-times monsters your players already have memorized. Instead, give them something they don’t know. And watch how they react to the unknown for a change. Yup, it’s time for another round of Weird Wildlife! Continuing the bird theme from last time, we’ll be taking a look at one today that goes in a different direction than most. 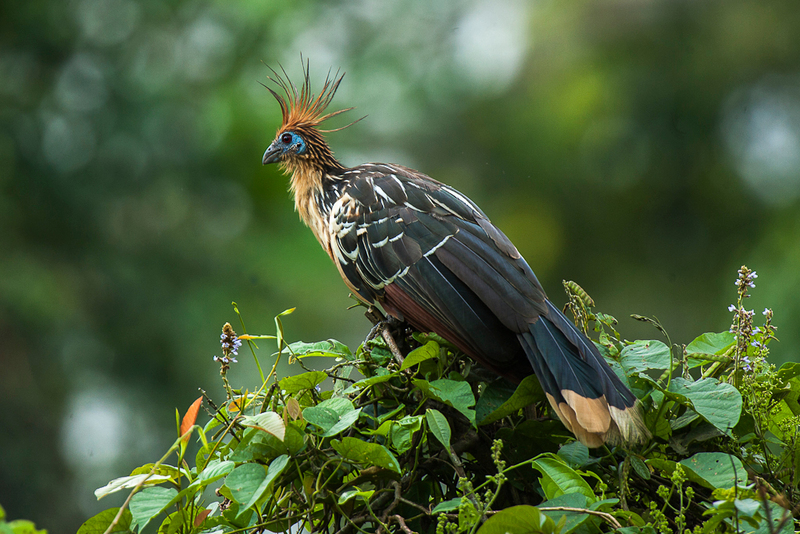 Allow me to present: The Hoatzin. Sure, it may look a little unusual with its bright red eyes and blue face, but that’s not why I’m sharing this creature with you. No, this lovely bird (also known as “The Stinkbird”, because ornithologists can be cruel sometimes) is unusual in many more ways than its simple coloration. For one, it primarily eats leaves. A section of its gut is devoted to fermentation to break down vegetable matter, a unique adaptation among birds but not among cows. This allows them to process a lot of vegetation without necessarily relying on things like berries or seeds (though they do eat flowers and fruit infrequently). It is this diet that supposedly gives them an odor of fresh cow manure or sweet-smelling hay. But perhaps one of the more interesting aspects of this bird is that, until it reaches about three months old, it has claws on its wings. That’s right, two claws on each of its wings. It uses them to get around the trees it lives in, as well as part of a defense against predators. See, the birds prefer to live in the swamps and mangroves of the Amazon. The young fowl, when confronted with an enemy they can’t escape or hide from, will throw themselves out of the tree and into the water. Turns out they’re excellent swimmers, as well. They swim away from the predator, and wait for them to leave, before using their claws to climb back up the tree and into the nest. Say, does this remind you of a previous type of bird that fell out of trees? 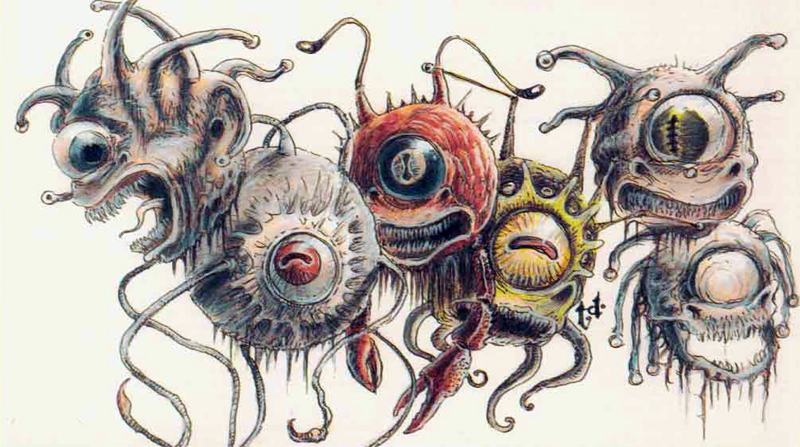 One thing you may not know about beholders, aside from their extreme xenophobia towards anything and everything, is how creatures so alien as beholders reproduce. First off, get those dirty images out of your head. They’re way too xenophobic for that. Turns out, sources actually differ a bit on the how. Probably because you have to be a certain brand of crazy to even try and find a beholder, much less study one enough in hope of finding out how even more are made. Volo is one such madman. In his guide, Volo explains that beholders are such magical beings that they reproduce by dreaming of other beholders, though such dreams are very rare indeed. Reality coalesces/warps/etc, and suddenly you have a new beholder floating near the previous one. Naturally, they both attack each other, but sometimes both will survive. The question I want to raise is this: What happens to an ecosystem that has species which violate the law of conservation of matter? Eventually, the beholders die, either to each other, a cave-in, disease, random adventurers, etc. Even the lich beholders eventually crumble into bony dust. Which means more matter, and potentially nutrients, for the ecosystem. Going back to the post I made on trophic levels, this would make Beholders a primary producer. Sure, not many things could kill a Beholder, and they’ll likely wind up killing most things themselves. But they still bring energy (and matter) into the ecosystem, even if at a very slow rate. So what happens with all the extra matter that builds up over the centuries or millennia? Does dirt get pushed above ground to make room for it over time? Is there a secret burial ground for dead beholders? Eventually, if the population lasted long enough or got far enough out of control, all that extra mass and all those extra complex molecules would start to make some interesting changes to the local environment. Especially on the geological timescale. And going back to the role as primary producers, you may have other species act as producers for the cave system they live in (through digesting away at rock or harnessing the energy from radioactive minerals), but who’s to say that some brave species of fungus or moss doesn’t start playing parasite to the magical ball of death? After all, if you can start growing on a beholder and keep it from getting rid of you, then you’ve got it pretty much made. Few other things will be able to touch you. Perhaps there’s some animals that lie in wait for a beholder to pass by, before striking to inject their young into the beholder’s body, sacrificing their life to do so? The young grow and mature inside of the living creature, feeding on its flesh (saving vital organs for last, much like a tarantula hawk wasp) before eventually burrowing out, killing the beholder in the process. This idea isn’t new, there’s many parasites that act that way. Fair warning, pretty graphic video I just linked. Maybe they give the beholder nightmares while they’re inside it. Very specific nightmares, which take advantage of the beholder’s ability to create life from dreams. Or maybe there’s a fungus that attaches its spores to the bottom of the beholder’s body or to its eyestalks, eventually growing into its brain and controlling its behavior? Again, not unheard of. Such a fungus could make the beholder seek out others of its kind instead of avoid or attack them. Or seek out other species that may help its lifecycle. I wonder what such a source of highly magical flesh would do to a species of parasite that lived off of it? Or how that might affect the other animals in the ecosystem, maybe becoming more and more condensed in each trophic level it goes up? What would the Tertiary consumer look like? How many games or television series have you played or watched that fell into the trope of either “humans as the everyman” or “humans as the average”? Where all other aliens were defined, ultimately, as “humans-but-[fill in the blank]”? It’s easy to understand, since most game designers are human (despite what the players of Dark Souls or similar games may think). We tend to see things in a very human-centric way. It’s a really hard trend to buck. However, buck it we must if we want to get a more accurate representation of what humans would really be like in a universe or world full of other intelligent beings that arose independently from humans. Some people try to focus on humans as special in a different way than how the other races or species are special. But often they usually do it in a way that reflects human values rather than human biology. Humans wind up being “the creative ones”, “the crazy ones”, or there’s talk about that indefinable “human spirit”. I say we go at it from another angle. 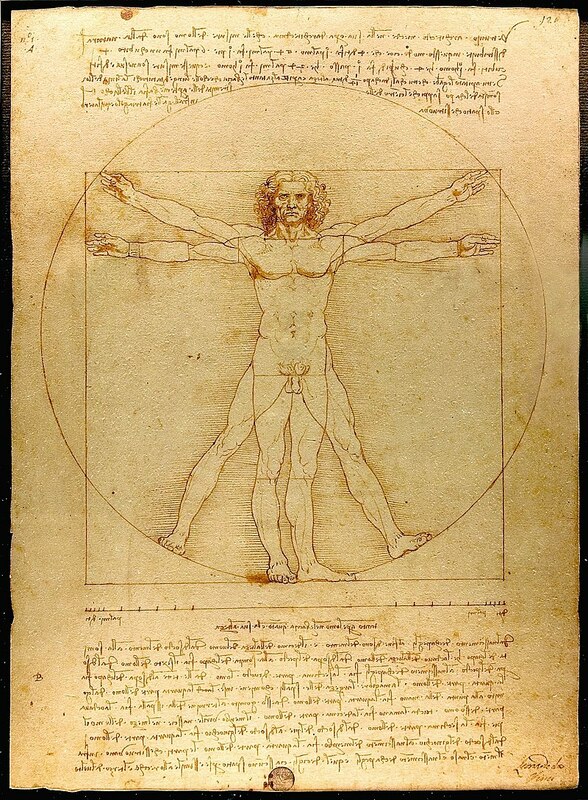 Instead of looking at the human from a cultural perspective, let’s look at humans from a physiological one. What are humans good at that doesn’t rely on the same things that any other civilization-building race of beings would have as a matter of course? We can’t include “building things”, because any species you include that uses complex tools would have to have the same mindset. Instead, what we find is a bit surprising. We can follow our prey days after the scent trail has gone cold. See, we don’t have to chase down what we hunt. We just have to follow it. At a leisurely jog or stroll, even. We just have to keep showing up, never letting it sit down to rest. Never letting it get a drink of water, while we sip ours from a gourd we carry. Never letting it cool off. Letting it tire itself out until it suffers from heat stroke, collapses, and if it doesn’t die right away we can walk up to the helpless animal and stab it, before dragging it back to camp. Compared to other animals (of similar fitness level), we don’t get tired. We have hyperactive scar tissue, and breaking a leg isn’t a death sentence for us while it means certain doom for some animals even if predators weren’t a factor. If you want to make humans unique, that’s the trait I suggest emphasizing. At least for physical differences. Either give a penalty to endurance-related rolls to every other race, or have the default set low and give humans a bonus. This doesn’t have to mean that other fantasy or alien races aren’t as deadly as humans in a fight. On the contrary, they could be much deadlier. It just means that we have the advantage if it gets to triple overtime. Remember, this isn’t about what species is better. It’s about keeping each species different. And I mean different in its own unique way, instead of just the cultural equivalent of palette-swaps, or leaving humans as the middleman. Imagine what the future would be like, 200 million years in the future, long after humans have taken to the stars. Imagine if they’d left Earth behind as a sort of “nature reserve”, not a single homo sapiens around, only checking in now and then to see how it’s doing. How would life on Earth evolve? This documentary seeks to answer that question. 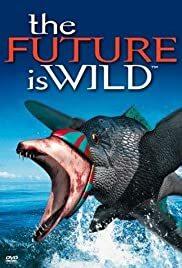 From fish that actually fly, to giant land squids, this documentary imagines many strange and unique takes on life as we know it. Some creatures seem stupid, others seem obvious, and yet others seem really clever. But then, that’s true of life right now, isn’t it? 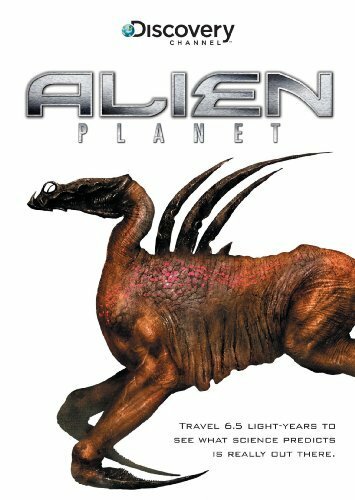 Alien Planet is a documentary that bucks that trend, and goes into imagining an alien world (named Darwin IV: a planet with two suns, 60% gravity and an atmosphere capable of supporting life) not based around what sort of intelligence might call it home (though that is the driving question for the exploration of the world), but instead investigates the natural environment and wildlife that may have grown on such a place. What the animals and plants might be like, or how some organisms might blur the boundaries between those two kingdoms of life. Both near and far, home and abroad, life can take a staggering number of possible forms. There’s almost no limit to the kinds of creatures you could expect to see, save your imagination. I won’t spoil the documentaries for you, if it’s possible to spoil a documentary in the first place, but I think you’ll enjoy taking a look at some of the things others have come up with. Who knows, you might even get an idea or two from it. So, I tend to focus a bit more on the fantasy side of things (heck, it’s in my dang tagline), but one of the best examples I’ve seen for an rpg putting heavy focus on a unique ecology is actually one based in Scifi: Blue Planet. Sit back and buckle your seatbelts, kids, it’s gonna be a bumpy ride. I’ll start off by admitting up front that I’ve honestly never had the chance to play a game of it. Even so, the setting they create makes me really want to! Sometime in the future, humanity has explored the solar system, and found a wormhole just beyond Pluto. Neat. The wormhole, it turns out, leads to another solar system which has, among its planets, one covered in water. And when I say “covered” in water, I mean that where Earth is 75% water, this planet they choose to call Poseidon is over 90%. And what’s more, it has life. Naturally, humans start planning to send a colony there. Being a bit more forward-thinking than we usually are, they use the latest genetic engineering technology to adapt a large group of volunteers to life on a mostly aquatic planet, giving some gills while giving others the ability to hold their breath for extended periods of time. On top of that, they also uplift various cetaceans to human-like intelligence for the voyage as well. Yeah, they went a little trigger-happy with the new technology. So, they send the colony ship to the new planet, with plans to send supplies every few years. See, even though it’s the future, space travel still takes a long time. No FTL drives here. The new colony arrives, everything is going as planned, when a new disease (likely brought about by the same trigger-happy use of genetic engineering) ravages the Earth. We’re talking apocalypse on a scale that dwarfs even the Black Plague and Spanish Flu. They abandon the colonists, unable to help them while the humans on Earth are struggling to survive themselves. As far as the colonists can tell, they just stopped sending new shipments, and cut off all communication. Eventually, the Earthlings have rebuilt enough to be able to look once more to the stars, and they remember that one planet they found so long ago. Sending a new expeditionary voyage out, they are surprised to see that the old colonists not only managed to survive, but they adapted quite well to life on Poseidon. Their old technology has almost completely worn down, without parts or tools to repair it save what they could make themselves. They now consider themselves relatively independent of the Earth that abandoned them to die. Things move along about as uneasily as you’d expect them to, until a unique mineral is discovered on the ocean floor of Poseidon. A rare mineral that incredibly enhances the human’s technology for genetic engineering to nearly godlike levels. A mineral that, when used with genetic engineering technology, can extend the human lifespan indefinitely. Can you say “gold rush”? Tons of humans, either poor ones with nothing to lose or big companies with everything to gain, take to the stars and a new world of opportunity! Boom towns start popping up on the few specks of land amid the tempest seas, trying to find the largest vein of this rare and elusive mineral, while angering the old colonists who see this as an intrusion on their new home world. Amid all of this, you have people trying to document and protect the undiscovered forms of life on the planet, some doing so more violently than others, while rumors of aborigines spread; an intelligent species native to the planet. Oh, and also: They call the mineral that can be used for long life “Long John”. It’s so corny but it still works. And yes, they DO have entirely new forms of life, including a whole book devoted to describing and laying out the ecology of the planet. It’s pretty cool, with floating temporary islands and strange new forms of sea life, etc. My favorite part is how you’re not even put into one specific role in the system (which uses percentage dice). You can just as easily be an ecoterrorist native human as an intelligent dolphin bounty hunter who brings down the ecoterrorists in exchange for money. You could play a scifi urban whodunit or an exploratory team of biologists mapping out the ocean floor for new forms of life and possible veins of Long John. So, if you like a new take on scifi, a scientifically developed ecology, having angry Killer Whale mob bosses, or you just plain liked the movie Water World, I recommend giving Blue Planet a try. Who doesn’t love the idea of riding a bear or a tiger into battle? The great general Hannibal was famous for crossing the Alps with a bunch of War-Elephants to cause havoc to ancient Rome. It’s often popular to portray dangerous domesticated animals to help sell the feeling that this is another world and culture. Unfortunately, you can’t just domesticate any animals you want. There’s certain qualities that make a species able to be easily domesticated, or all but impossible to domesticate. We can tame wild animals, sure, but that’s no domestication. And even taming can be difficult sometimes. Tame animals are basically wild animals that we just happen to keep fed and have taught a few tricks or general behaviors. They’re still wild animals. Getting the two confused is how people wind up trying to adopt tame leopard cubs and are found mauled to death in their house years later. Domesticated animals, on the other hand, are animals that humans have been able to breed and change over the course of generations, both physically and mentally, making them much easier and safer for humans to handle while also making them much more useful to humans. It’s why wild wolves are a combat encounter, but their domesticated cousins love to entertain and help us. You can have tamed animals, but they’re going to be difficult (if not impossible) for the average joe to keep under control compared to domestic animals, and you have to do it on a one-on-one basis. Okay, that’s nice and all. But what makes an animal good for domestication? Step one to domesticating any animal species is to capture a few, and be able to handle them without getting yourself killed. This is why we haven’t domesticated bears or buffalo. (Orcs or other physically powerful races may have better luck with animals in this category) Pretty self explanatory, you’re not gonna get people to start caring for an animal that’ll likely eventually kill them. Even without being murdered outright, some animals are still a bad choice for this reason, due to habits like for example biting hands and not letting go, which is a trait of the zebra. Nobody wants to breed animals that wind up maiming them, killing them, or otherwise reliably hurting them in very serious ways, unless they can find a way around it, like rubber bands on lobsters’ claws at the store. This also extends to simple ability to keep the animal penned. Most animals large enough to be useful are also either powerful enough to tear up anything an early society can put together to contain it, or nimble enough to simply leap out. (See again: buffalo) Even if you’re a walking and talking gorilla, you need some way to keep the animal from breaking out of wherever you put it. Whatever animal you want to domesticate needs to eat things that you don’t. Either grass or bugs or rotting meat or be happy with just your table scraps. They shouldn’t be picky. The benefits of keeping enough of the animal around to domesticate must outweigh the costs you spend in caring for it, and that includes the things you have to lose to feed it. Remember, food wasn’t as readily abundant throughout the vast majority of human history as it is today. Famine is a horseman of the apocalypse for a reason, and any ancestors of the society you want to have domesticated said animal needs to be able to spare whatever is going to disappear down that animal’s gullet on a regular basis. If it does eat the same sort of food as the ones doing the domesticating, then it better be really worth the increase in food prices and risk of starvation. That’s why most domestic animals tend to be herbivores who we can use as a source of food ourselves. Read: comparatively eager to have kids. The ability to breed animals over generations generally requires the ability to track said animals over those many, many generations, in order to be able to make any progress. There’s no sense in trying to spend countless man hours for a group of animals that either take forever to grow up and have kids, or who have weird and highly restrictive requirements before they’ll reproduce. Otherwise, why bother? Your animal in question needs to have a very short time between when it’s born, and when its own kids are born (or hatched, or whatever). The shorter the time, the more quickly it can be domesticated, and molded into a form that’s even more useful. Any long-lived race would have much better luck than humans in this area. And since the much larger animals tend to have long times between kids and longer times to grow up, the longest-lived race is the one whose culture is more likely to have actually domesticated elephants (whether to increase tusk size for ivory shaving, stronger trunks for construction and shipping work, or shaping their bodies for war). If you had to tame and individually domesticate every single organism you wanted to use, it’d take a while. Again, something the Elves might have better patience with, but even beyond that it’s simply much easier if you can get an entire group of animals to follow you just by taming one of them. Animals with a well defined social structure are much easier to domesticate, because all you have to do is put yourself on top of that structure and then watch as all the animals start following you around with minimal effort on your part. Horses (unlike zebras) have a solid social hierarchy, each horse following the lead when they travel, so if you can tame the lead horse then you can take the entire herd wherever you like. Animals with good family values are much easier to tame in the first place if raised from a young age, and you have to spend much less energy keeping them in line once you establish your position. They keep themselves in line. You’ve probably noticed by now that all of these points basically boil down to making it easier to domesticate an animal. Which is true, since the civilization that starts the domestication is going to be usually on a much lower tech level than you’re used to. Now granted, once domestication gets going you can start breeding for those sorts of behaviors, helping your multi-generation project move along a bit faster, but you need a place to start from. So when you’re creating that new unusual domestic or tame animal for your culture, it helps to keep in mind what qualities might wind up making it a good choice, and what qualities might wind up making it a bad one. Or, when you’re looking at different monsters or wild animals, which ones might be easier to domesticate. Once you manage it, however, you can change a species so much they could be mistaken for another species entirely, or simply do a few tweaks along with making them much more able to get along (and obey) humans (or whatever species did the domesticating). That’s how you go from Wolf to Chihuahua. Or from dog to Dire Wolf. Species aren’t really as well defined as we often like to think. Now and then, you come across something that reminds you that the idea is mostly a human-created tool in order to make categorization easier. One of the classic definitions of species goes along the lines of “a population whose members can interbreed with each other to produce viable offspring.” Keyword being “viable”, which is why horses and donkeys are considered different species despite being able to make (sterile) mules. That definition doesn’t always work right, though. Probably one of the best examples of this is what has come to be called the Ring Species. Say you have a species of salamander that lives in the streams of a certain mountain range. But the tops of the mountains themselves are too high for the salamander to cross. Instead, the population slowly spreads around the range, until it finally spreads far enough to reach a pass low enough for them to live in and spread through. Eventually, the population has managed to encircle the entire mountain range and meet up with the other end of the population, which spread in the other direction around the mountains. The only problem is that the species took so long as it spread, that the two ends have evolved far enough apart genetically that they can’t reproduce. There’s still a viable chain of population groups between the two, each of which can still reproduce viable offspring with the ones next to it. As far as any salamander in the middle of the chain is concerned, they’re the same species as their neighbors. But drop them elsewhere in the chain, and they might not be. That salamander, by the way, is Ensatina eschscholtzii. Better examples include the Larus Gull, which instead of reproducing in a ring around a mountain range, reproduce in a ring around the North Pole. To make sure I’m being clear, in this image, gulls at point 1 can breed with gulls at point 2, which can breed with gulls at both points 1 and 3, etc. But the gulls at 1 and 7 can’t breed with each other. Now that you get the basic concept, let’s take a closer look at what we could do with it! It doesn’t really require that a Ring Species have only two “ends”. That’s simply the example most likely to occur in nature, where Ring Species are pretty rare anyway. But there’s nothing stopping you from creating gradients of species that have multiple splits due to geography or other phenomena, resulting in multiple ends. Or the Morlocks and Eloi as branches off of humanity. The genetic variation could also express itself however you like. You could have ring species separated not by physical obstacles but by things like breeding seasons, or mate selection. I could even see a plot point or two where the center sections of a Ring Species are destroyed in a climactic disaster, and the two ends pick up the pieces and continue on as two new-ish unique species. It likely won’t be something you use regularly, but I think it’s still a neat concept you can keep in your back pocket for an interesting scenario or two when you need it. The Underdark. A massive series of caverns cobwebbed under the entire globe, many large enough to fit whole cities, while others can be a maze of twisting stone passages that make it easy to get lost. Home to the infamous Drow, Durgeur, Illithids, etc. It’s become a pretty well known segment of the typical D&D world, and for understandable reason. It basically takes everything popular about crawling around an underground lair where everything wants to kill you and ramps it up to 11. Players like the sense of danger, DMs like the fact that it’s somewhat easier to build and direct players in certain directions with, and both like the relative simplicity. Why not take the same basic stuff from the Underdark, and put it on the bottom of the ocean instead? I don’t mean a series of caverns in the ocean floor, or a giant bubble underwater. I mean take all the creatures, monsters, etc, make them Aquatic, and have them all live on the bottom of the ocean, in Davy Jones’ Locker. It ranges from dark to inky black on the lower levels of the sea, even with a light (which attracts the wildlife, so you need to weigh your options). Aside from the palette-swapped clones of surface races (Drow, I’m looking at you) the majority of the things found in the Underdark would seem right at home on the ocean floor as well. Heck, it’d make it even easier to use Aboleths and the Kuo-toa. And Beholders and Mind Flayers already look like they belong down there. Cloakers could be a kind of Manta Ray, etc. The life that already exists down there is terrifying enough as it is, not to mention all the sailor’s tales of sea monsters you could use. It’s an environment that already exists in almost every setting you’ve seen, was likely not being used very much, and you don’t have to wonder why the surface doesn’t just collapse already from being hollowed out with so many Underdark caverns. It even has a multitude of different environments and ecosystems within it, from bright and vibrant kelp forests and coral reefs to brine lakes (yes, there are lakes underwater, and they kill things because why not), to underwater mountains, sinkholes, valleys, canyons, and vast empty plains. It’s a simple matter to reskin some already existing monster stats into things like a Giant Anglerfish, but the completely new look will definitely throw your players off and make it feel brand new again. It’s big. I don’t think most people really conceive of just how mind-bogglingly HUGE the ocean is. This, along with natural buoyancy, makes it much more believable and realistic to have giants of one kind or another. Creatures the size of a small mountain who can stand straight up and still not brush the surface. And you know all that stuff you’ve packed into a handful of continents in your world? Odds are you’ve got even more space to play with in those oceans of yours. Heck, the very floor of the ocean is called the Abyssal Plain. How’s that for an inspiring name? Think about it, your players walking along the sea floor, literal miles of empty water between them and any breathable air, save the small magical or technological trinket each of them wears. If those devices fail, they’d die before they even knew anything was wrong, the sheer pressure of the deep crushing them like a paper bag that had a house dropped on it. They’ve elected to use torches/flashlights, and aside from the curious sharks who come to look at them now and then before swimming off, it seems silent. The darkness stretches in all directions. Then, suddenly, they see the bottom end of a huge tail fin, twice the size of a building, slowly glide into view and glide out again. And once more, all is quiet. What’s that? You like the Drow? Simple, replace spiders with giant long-legged crabs (like the Japanese Spider Crab), and give the culture to Mermaids or Sirens, luring sailors to their doom and wrecking ships to steal away a fresh supply of prisoners and/or food. Or just have some species of spider live in the ocean. There’s already spiders and beetles that live under freshwater. You could even have the Umber Hulk be a version of those for salt water. Oozes fit pretty well underwater, too, and could even be adapted as some sort of plant or algal slime. With the Underdeep, you replace the cramped cave walls of the Underdark for something far more terrifying: vast black emptiness, where death can approach from literally any direction, even the very ground you trod on or swim over. This also gives you the perfect opportunity to try out some Cthulhu lore if you’re so inclined. The players are at a disadvantage if they go in with their normal door-kicking, club-swinging routine, on top of being completely out of their element anyways. Everything they find there has an actual home field advantage. And they know it. Creatures ten times their size can easily and silently sneak up on them, shipwrecks and sunken cities could have old treasures for the taking, and the nameless cities of the Aboleth and Mind Flayers could wage war or trade goods and slaves indifferent to the world above. You don’t even need to involve a sentient race of horrors. The natural world down there is horrifying enough! Plus, how better to make the PCs feel vulnerable than to make them feel so very, very alone? So give the Underdeep a chance! See how your players handle a REAL challenge.